Although this plan was adopted on 12/22/88, it is still the current plan on record. It does not seem as outdated as one would think, in these fast changing times. The basic concerns are still pretty much the same. That is good news to those of us who have moved here because we like it pretty much the way it is. Unfortunately improvements can bring other changes that are not so welcome. Take them with a grain of salt. Outdated and extrapolated information, and applying a template designed for cities, makes for some questionable results. Don't let this scare you. We are a nice community that just happens to have had some "mixed company." BADDA BING, BADA BOOM, BADDA BANG! The Water Link Between Pinon Mesa and Fruita - This article from the Grand Junction Daily Sentinel by local historian Kathy Jordan tell the story of how the Fruita's search for a clean water supply created a lasting link between Pinon Mesa/Glade Park and Fruita, CO. Physical description: The Glade Park/Pinon Mesa area is located where the the north western end of the Uncompahgre Plateau has been severed into a separate land mass by Unaweep Canyon. It begins in Colorado, and continues on into eastern Utah. Elevations:4100 to 9671 on Pinon Mesa. Pinon Mesa runs along the North edge of Unaweep Canyon, and on the west end, along the Delores River canyon. Gamble's oak increases with elevation, along with Englemann spruce, and subalpine fir, and aspen. Along the lower rivers and streams, cottonwoods and willows fight for space with invasive tamerisk. As the name implies, Glade Park is the lower, flatter, open park that is dominated by sagebrush, pinon pine, and Utah juniper. On the west end, the park looses elevation, and is bordered on the north by sandstone cliffs. "Geologically, the area is a remnant of an ancient highland know as Uncompahria, a part of the ancestral Rocky Mountains which were uplifted 300 million years ago. During the Pennsylvania period, when the rest of Colorado was under an inland sea, Umcompahgria was an island. Erosion during the Pennsylvania period removed all the rock layers above the Precambrian metamprohic rock. By the end of the Permian, the landscape was nearly a level plain. The Precambrian rock was again buried by sediments during the Triassic and Jurassic Periods, leaving an unconformity representing over 300 million years, or the entire Paleozoic sequence, between the Precambrian and Triassic. The Mesozoic sediments can be seen now as the Cutler, Moenkopi, Chinle, Kayenta and Wingate sandstones of the Triassic, and the Entrada and Morrison formations of the Jurassic. Over these layers were deposited the Dakota and Mancos formations of the Cretaceous period. The Plateau was again uplifted later in the Cretaceous period, along with the Rocky Mountains during the Laramide Orogeny, thus beginning a new period of erosion which continues today. 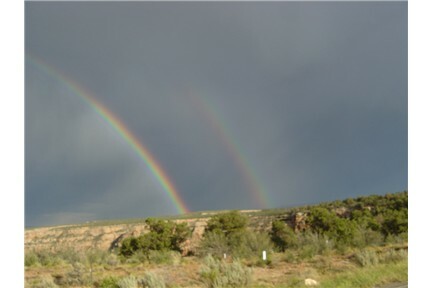 The last major uplift occurred during the Miocene, when the entire Colorado Plateau was elevated ( Chronic 1980, Collins 1985).